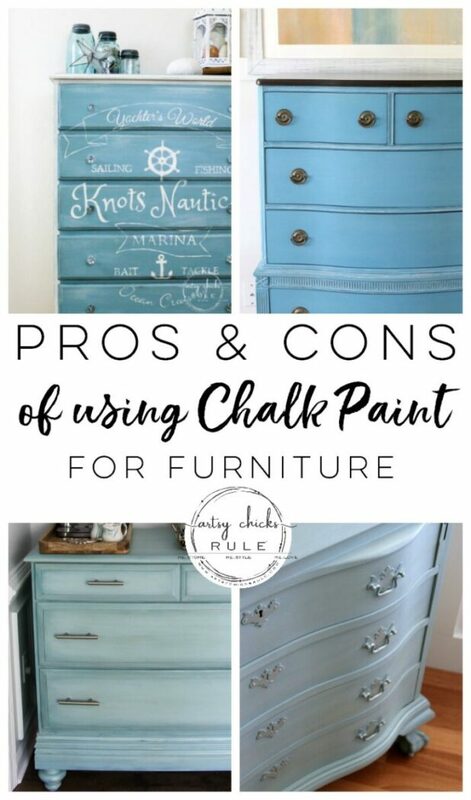 Today I’m sharing all the pros and cons of chalk paint for furniture. 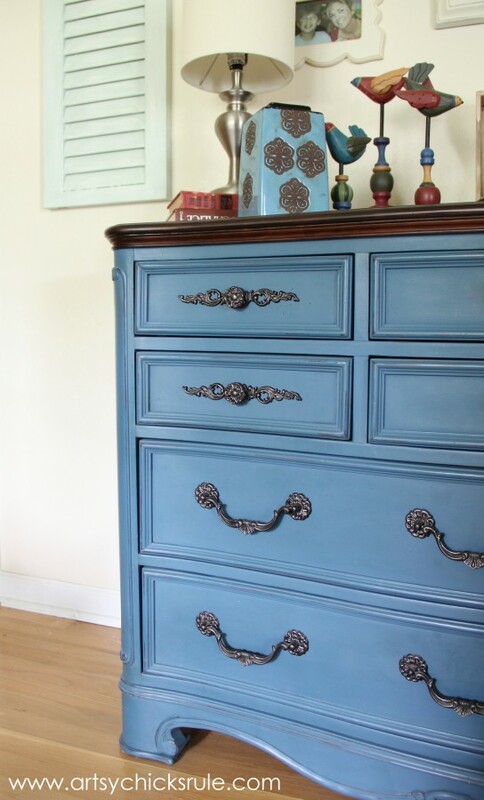 Plus, a few of my favorite chalk painted furniture makeovers too! Since I use a lot of chalk style paints (mostly Annie Sloan, which I love), I thought I’d write a post detailing the pros and cons of chalk paint for furniture. Yes, there are pros AND cons to it. Well, there’s pretty much pros and cons to everything, right? It’s always good to know what they are before you begin a project so I hope this post is helpful to you. 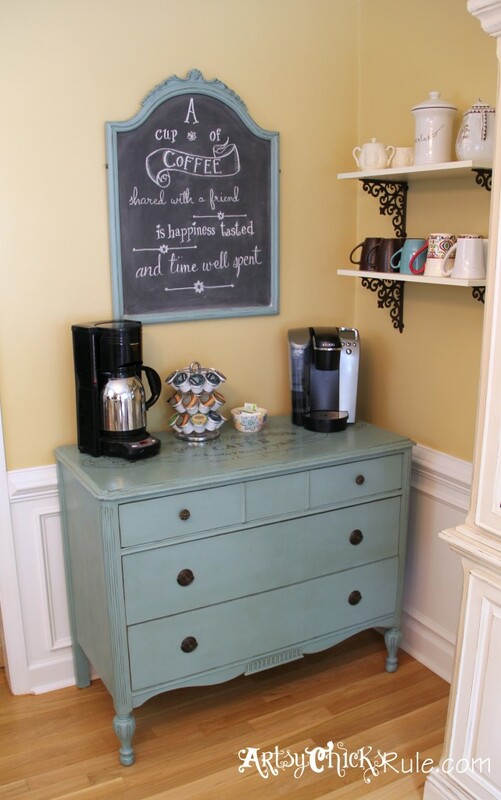 Not only that, I thought I’d share some of my favorite chalk painted furniture makeovers while I’m at it. You guys know I’m a chalk paint and chalk style paint fan. But I’d even have to agree, there are cons to using it. 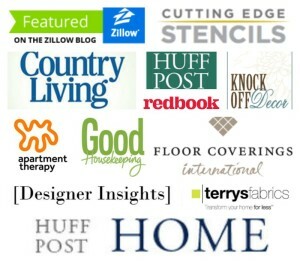 Even so, I’ve created, and continue to create, some really great furniture makeovers using it. But first, let’s take a look at one of my favorites…. Surprise, surprise! 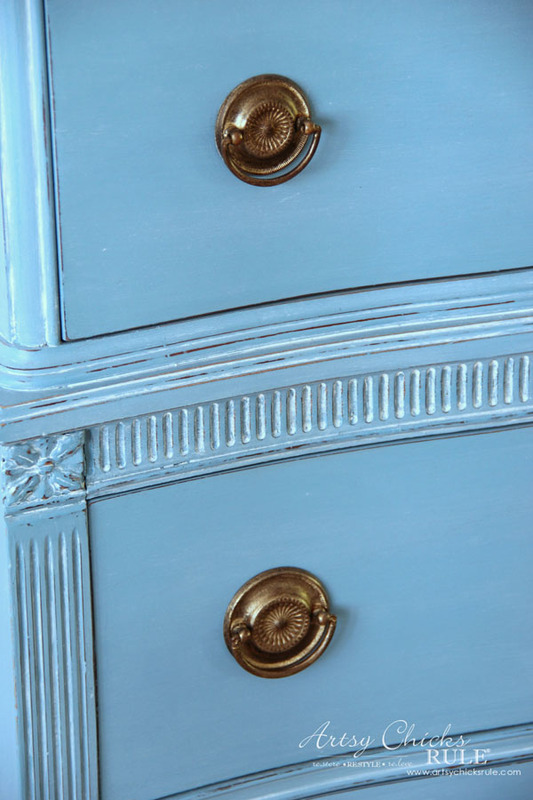 My Aubusson Blue dresser. It’s the first chalk painted piece I shared here on the blog, oh, about 7 or so years ago. To this day, it is still at the top of the list for me. Okay, let’s get to the nitty-gritty of the pros and cons of chalk paint, or any chalk style paint. 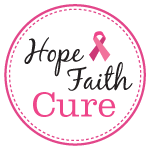 No prep needed….most of the time. No primer needed….most of the time. No sanding needed….most of the time. Can be thinned and used in a sprayer. 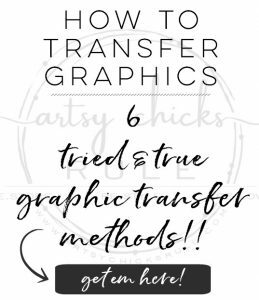 Blends easier, and nicer, for artistic painting techniques and applications. Now let’s talk about those for a minute. 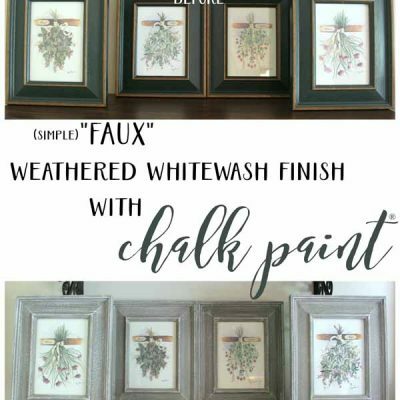 Yes, no primer is typically needed with chalk paint. But you really can’t say that across the board. There are just going to be those times when a primer is necessary for any type of paint. One of those times and one that comes up often around here is when you are painting a reddish type of wood/stain. That absolutely takes “prep” in the form of applying some sort of primer/sealer to seal in that red so it won’t bleed into your paint. You may come across other times when something that has soaked into the wood continues to rise to the surface through the chalk paint. It too would need some sort of primer to seal it up. How about wood that has a rough, chipped or my favorite (not!) a really slick finish on it? Do you really think it won’t need some prep work? I know some people out there would say no, but I don’t usually chance that. 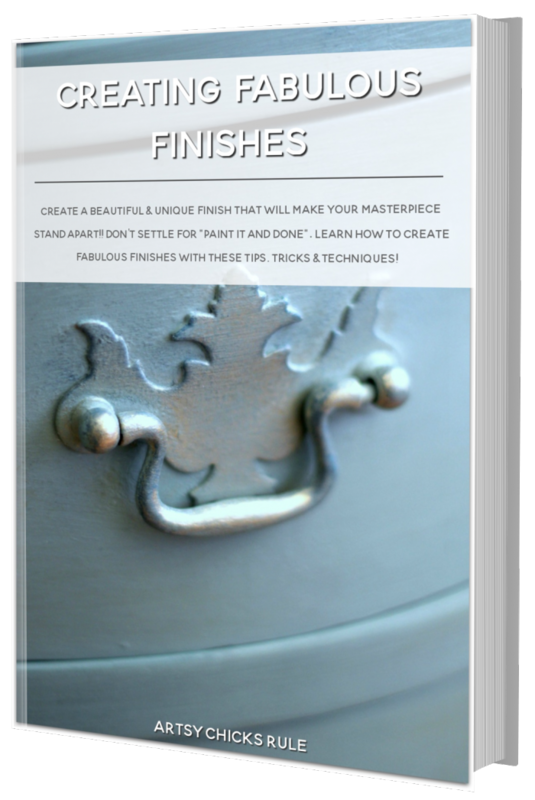 If you have a really slick finish, you need to prep before using chalk paint. 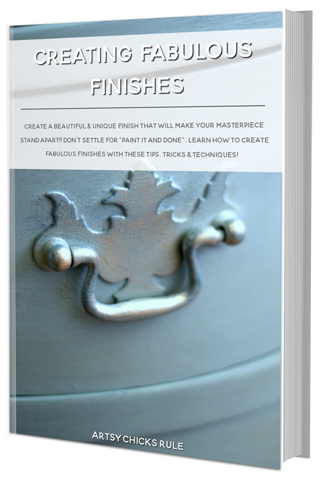 If you have a rough or chipped finish, you need to prep. But overall, yes, in most cases, chalk paint is pretty user-friendly in that it really does require little prep. It will stick really well to your stuff. ;) But use some common sense along with it. 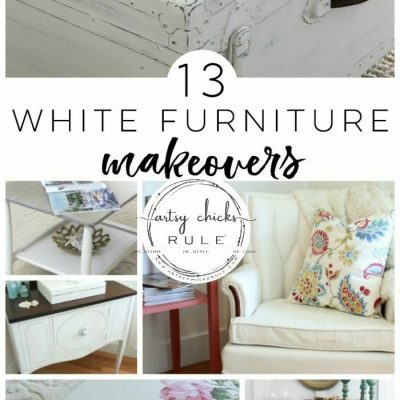 Time for a pretty furniture makeover break. Another of my favorite chalk painted pieces…. This old coffee bar dresser I painted years ago. It was the coffee bar before I created the newest one I have now. This dresser and “mirror”/ chalkboard now lives in someone else’s home. Okay, back to the PROS of chalk paint. Yes, it really does dry pretty quickly. Well, hmm, I do think it can. But that all depends on the color and the coverage you are getting. Which I will say, is usually pretty good with chalk paint. Using it in a paint sprayer. I absolutely love that it can also be used in a paint sprayer. That is a game changer when it comes to painting. 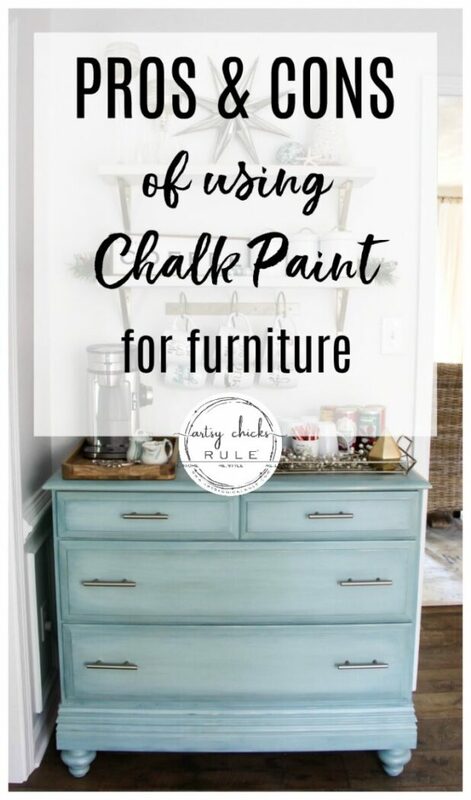 Because, if you have used chalk paint or any chalk style paint, you know it can leave brush marks. So even though, as you’ll see below, brush marks are listed as a “con”, I don’t really consider it one. There are many ways around it. You will hear people complain about this being an issue with any type of chalk paint, but it really is a non-issue. No, I’m not talking about blending together two paint colors to come up with a different color. I’m talking about artsy techniques. Blending 2 or more shades together to create variations, ombre or other designs. 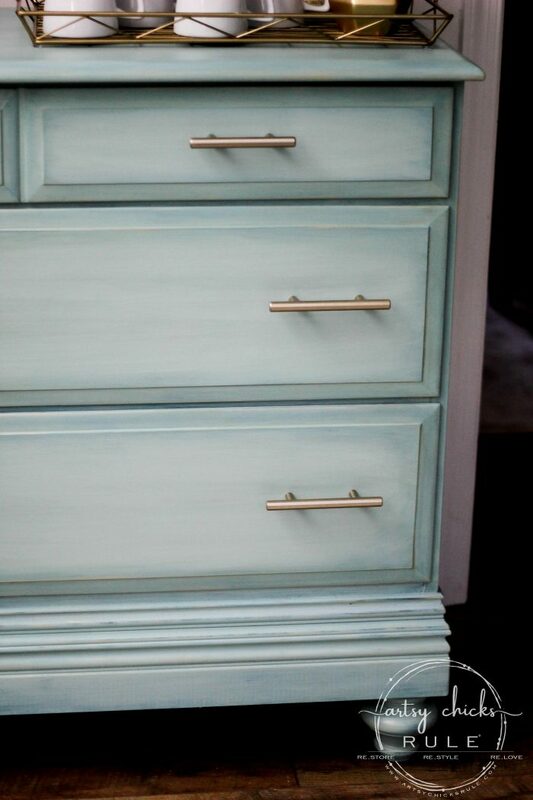 Chalk paint and chalk style paint for the win here, for sure. Speaking of blending colors. Here’s a perfect example of that. This would’ve been much more difficult to achieve with latex or other style paints. The chalk style paints just do this so effortlessly. It distresses really well as if time had worn it down. Exactly the look you are going for. You can distress it before you seal or after. And you can even distress with a wet rag or paper towel. That’s not something you can do with something like latex. Have you ever tried “distressing” latex paint? Sure, it works sometimes. But most times it sort of rolls off, or peels off, instead of looking like it was smoothly sanded off or worn away naturally. Look, I’ve painted with just about anything and everything you can imagine and I can tell you, chalk paint and chalk style paints clean up easier! They just do. It’s just how it is. I can let chalk paint dry on a brush and soak it, and voila, good as new. 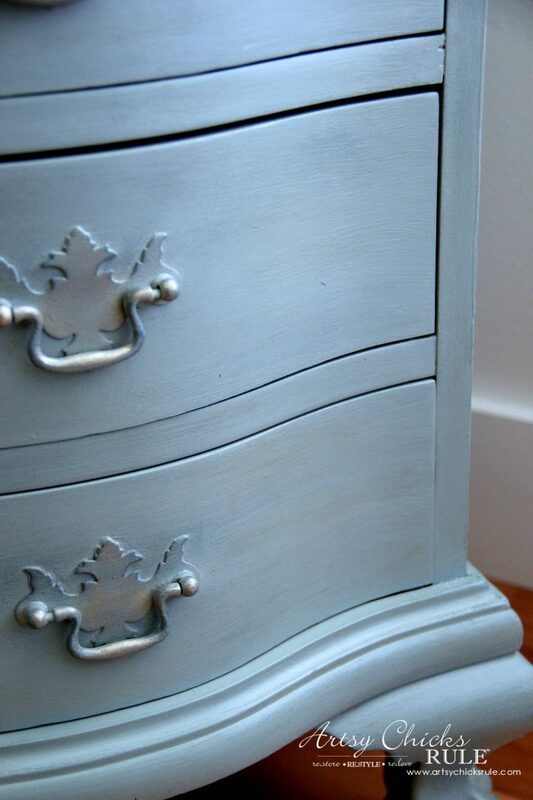 Let me share another one of my favorite chalk painted furniture pieces before we continue. I still have this one and use it in my bedroom. It’s a beauty. Isn’t always “no-prep” and “no primer”. Stains will bleed through this paint more than latex and other types of paint. Can be hard to find/purchase. If using wax to seal, it can be labor intensive. Waxing needs to be repeated at a later date to continue to protect the piece. As I already mentioned above, no, chalk paint is not always no prep. I don’t really consider this a con. As I said, it is not magic, so I wouldn’t expect it to be perfect in all situations. And not all situations (furniture) are the same. Some are rougher than others. Not unless you want to or are going for that look. As I already mentioned above in the “pros” section, there are many ways to combat that. Some stains will bleed through the paint. Not only that reddish wood but just your everyday stains and such. That’s just the nature of this paint. It is more porous so it will allow things to “soak through” at times. No biggie though, it’s easily remedied. It does however always need to be sealed. Well, unless you are using it outside, then you can leave it unsealed. Typically though, it needs sealing. Yes, chalk paint is pricey. It’s more of a boutique brand and the price reflects that. Most chalk style paints are as such. 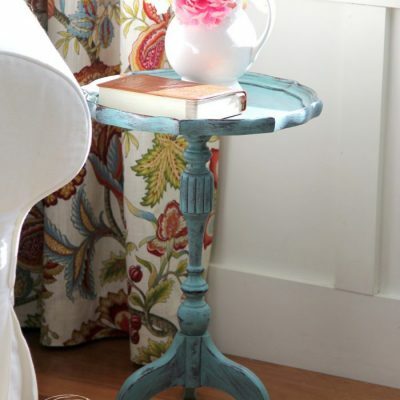 One that I love and use quite a lot these days is Rustoleum’s chalk style paint. I’ve been very happy with them. I do wish they had more colors though. This is another oldie and one I still have in my home. I created this fun graphic to paint onto the front. I used my $35 Craigslist projector on this one! Chalk paint can be tough to find to purchase. Since it is a “boutique brand”, you will have to hope it is sold in one near you. If not, you can find it online but then hefty shipping is usually involved. I’d say this is a definite con. I do love how a wax finish looks (and feels) but I don’t love applying it. I just really do not. It is somewhat labor intensive and who has time for that? Not only that, but you will need to reapply it over time. No thanks. It just means it is by no means my go-to. I could do a whole post on the pros and cons of waxing and this post is long enough already, so I’ll just leave it at that. I’ve used many top coats and a few new ones (to me) recently, and I still always go back to my old favorite. It just stands the test of time for me. It’s solid and made by General Finishes. 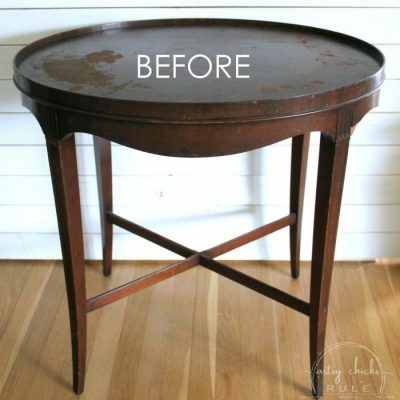 Let’s leave you with another of my favorite furniture makeovers. It is one of those that I did indeed use wax on. So there is a beauty in that. The wax really did create a lovely finish. That is when I would use wax. When you want a specialty finish that poly just won’t give you. I hope you enjoyed this post today. 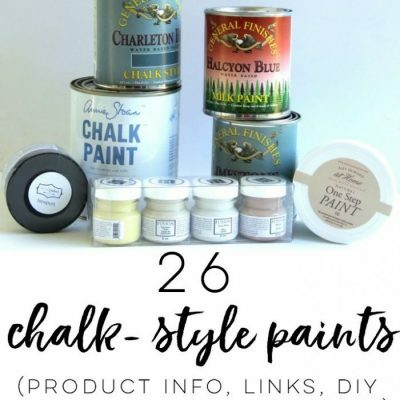 If you have considered using any of the chalk style paints, I hope this has helped you with your decision. There are quite a few pros and cons of chalk paint, but the cons are really not ones that can’t be overcome. And remember, there are cons with any product you may decide to use. Understanding what they are is the most important step to deciding which one will be your choice. 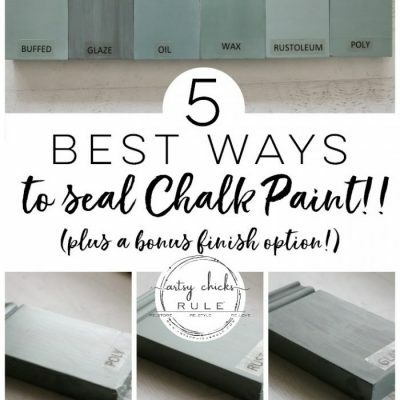 Nancy, these are great tips/reminders about chalk paint. I make my own which seems to work better than some of the boutique brands I’ve purchased though, I admit, I haven’t invested in any of Annie Sloan’s paint. Thank you for all the beautiful photos as well. You create amazing things! Someday I hope to get a paint sprayer. Hi Nancy. 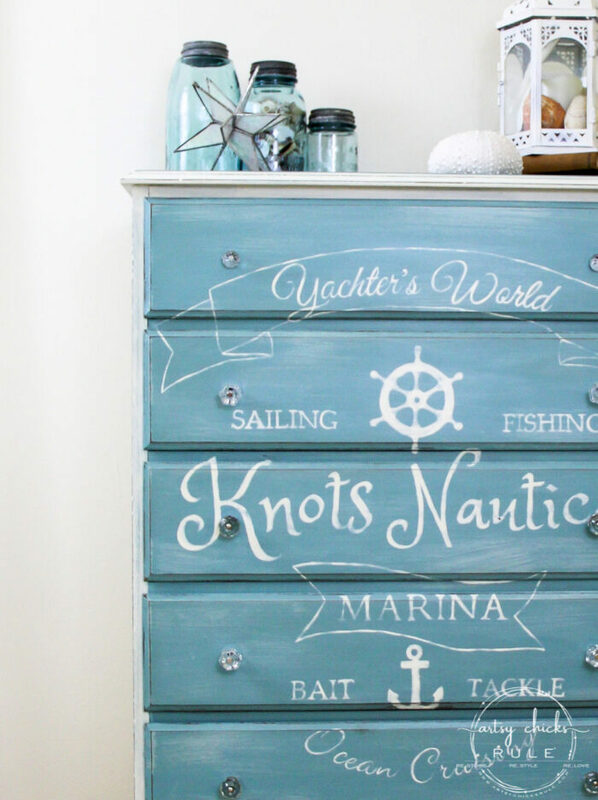 I love chalk paint, too, for the many reasons you list. Also hate waxing! What sealer do you generally use? I have a question. I want to paint over my painted cabinets, will chalk paint work, and have you had any problems with wear; like around the drawer pulls? Fantastic post! I have been following you and Chrissy for so long…….lol! I needed this brush up. Thank you! 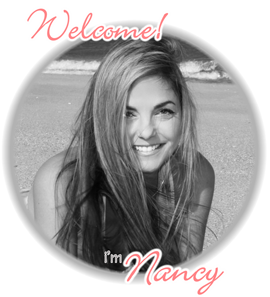 Thank you for this post, Nancy!!! Very helpful! It helped to clear up my wax questions. I will not fear going wax-free. Hi Nancy, what did you think about the Polyvine sealer. You said that you had ordered it and were looking forward to using it that afternoon but I never heard further. Can I assume that you didn’t like it? Its the only sealer I used these days. 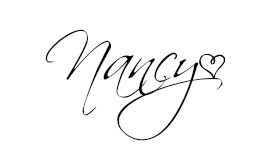 Hi Nancy, thanks for your quick reply. I did miss it. Some get to me and some don’t. That’s the power of the internet I suppose. Best wishes.